Behavior-Driven Development (BDD) is a collaborative process where the Product Owner, developers, and testers cooperate to deliver software that brings value to the business. BDD is the logical next step up from Test-Driven Development (TDD). In essence, BDD is a way to deliver requirements. But not just any requirements, executable ones! With BDD, you write scenarios in a format that can be run against the software to ascertain whether the software behaves as desired. Given indicates the initial context, When indicates the occurrence of an interesting event, and Then asserts an expected outcome. And may be used to in place of a repeating keyword, to make the scenario more readable. Given/When/Then is a very powerful idiom, that allows for virtually any requirement to be described. Scenarios in this format are also easily parsed, so that we can automatically run them. BDD scenarios are great for developers, since they provide quick and unequivocal feedback about whether the story is done. Not only the main success scenario, but also alternate and exception scenarios can be provided, as can abuse cases. The latter requires that the Product Owner not only collaborates with testers and developers, but also with security specialists. The payoff is that it becomes easier to manage security requirements. Even though BDD is really about the collaborative process and not about tools, I’m going to focus on tools for the remainder of this post. Please keep in mind that tools can never save you, while communication and collaboration can. With that caveat out of the way, let’s get started on implementing BDD with some open source tools. JBehave is a BDD tool for Java. It parses the scenarios from story files, maps them to Java code, runs them via JUnit tests, and generates reports. JBehave has a plug-in for Eclipse that makes writing stories easier with features such as syntax highlighting/checking, step completion, and navigation to the step implementation. throw new IllegalArgumentException("Story file not found: "
The @UsingSteps annotation links the steps in the scenarios to Java code. More on that below. You can list more than one class. Our test class re-uses the JUnitStories class from JBehave that makes it easy to run multiple stories. We only have to implement two methods: storyPaths() and configuration(). The storyPaths() method tells JBehave where to find the stories to run. Our version is a little bit complicated because we want to be able to run tests from both our IDE and from the command line and because we want to be able to run either all stories or a specific sub-set. We use the system property bdd.stories to indicate which stories to run. This includes support for wildcards. Our naming convention requires that the story file names start with the persona, so we can easily run all stories for a single persona using something like -Dbdd.stories=wanda_*. The configuration() method tells JBehave how to run stories and report on them. We need output in XML for further processing in Jenkins, as we’ll see below. One thing of interest is the location of the reports. JBehave supports Maven, which is fine, but they assume that everybody follows Maven conventions, which is really not. The output goes into a directory called target by default, but we can override that by specifying a path relative to the target directory. We use Gradle instead of Maven, and Gradle’s temporary files go into the build directory, not target. More on Gradle below. Now we can run our stories, but they will fail. We need to tell JBehave how to map the Given/When/Then steps in the scenarios to Java code. The Steps classes determine what the vocabulary is that can be used in the scenarios. As such, they define a Domain Specific Language (DSL) for acceptance testing our application. Our application has a RESTful interface, so we wrote a generic REST DSL. However, due to the HATEOAS constraint in REST, a client needs a lot of calls to discover the URIs that it should use. Writing scenarios gets pretty boring and repetitive that way, so we added an application-specific DSL on top of the REST DSL. This allows us to write scenarios in terms the Product Owner understands. With the Steps in place, we can run our stories from our favorite IDE. That works great for developers, but can’t be used for Continuous Integration (CI). Our CI server runs a headless build, so we need to be able to run the BDD scenarios from the command line. We automate our build with Gradle and Gradle can already run JUnit tests. However, our build is a multi-project build. We don’t want to run our BDD scenarios until all projects are built, a distribution is created, and the application is started. Here we see the power of Gradle. We define a new task of type Test, so that it already can run JUnit tests. Next, we configure that task using a little Groovy script. 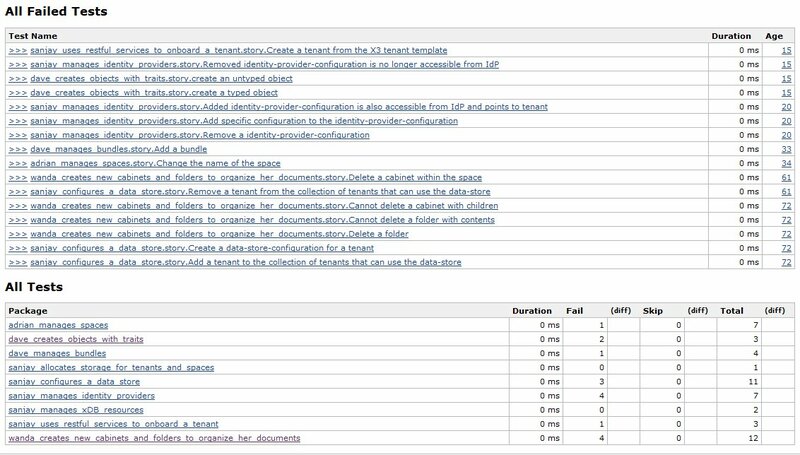 Next, we add support for running a sub-set of the stories, again using the bdd.stories system property. Our story files are located in src/test/resources, so that we can easily get access to them using the standard Gradle test source set. We then set the system property bdd.stories for the JVM that runs the tests. So now we can run our BDD scenarios from both our IDE and the command line. The next step is to integrate them into our CI build. We could just archive the JBehave reports as artifacts, but, to be honest, the reports that JBehave generates aren’t all that great. Fortunately, the JBehave team also maintains a plug-in for the Jenkins CI server. This plug-in requires prior installation of the xUnit plug-in. After installation of the xUnit and JBehave plug-ins into jenkins, we can configure our Jenkins job to use the JBehave plug-in. First, add an xUnit post-build action. Then, select the JBehave test report. Notice how the JBehave Jenkins plug-in translates stories to tests and scenarios to test methods. This makes it easy to spot which scenarios require more work. All in all these are minor inconveniences, and we ‘re very happy with our automated BDD scenarios. Nice Post.. Do you have a working code hosted in gitHub? I don’t at the moment. In my project I have customized report generation by making changes in FTL files of resources folder..my folder structure is looks like src/main/java and src/main/resources…now when I am running through IDE(eclipse) when the reports are generated in target folder, there are generated as per the changes made in FTL file but when i try to run through maven command line, the reports are not getting generated with changes i made in ftl file …so somehow call is not being reached to src/main/resources folder where changed FTL file places..any idea why? what could be possible problem? Nice Article. I personally prefer to write tests for java applications in groovy – it is much easier, less noise and groovy much more expressive to write tests. Saying that, my favorite BDD framework is Spock. So I would suggest this tool set for testing – Spock -> Gradle -Jenkins.